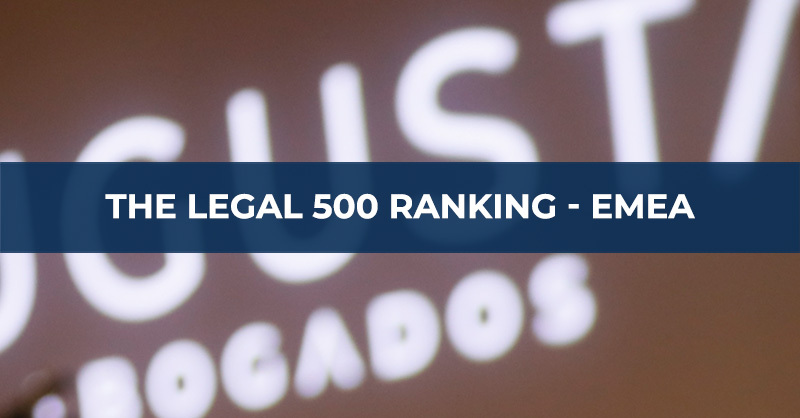 AUGUSTA ABOGADOS has been included in the 2019 edition of the prestigious Legal 500 EMEA directory in the areas of Intellectual Property (“Copyright” and “Trademarks”) and Transport. In Intellectual Property, Legal 500 highlights the great work carried out by our partner Carlos Valls in a procedure on counterfeits, as well as his participation in an important litigation on trademarks. In Transport, AUGUSTA ABOGADOS has been recommended as a First-Tier law firm for having “a strong aviation department commended for its ‘client focus‘“, managing a portfolio of clients that includes important airlines. The directory specifically highlights our partners Sergi Giménez and Jaime Fernández, placing them among the leading individuals in this area of law in Spain. We would like to thank our clients and colleagues for the trust vested in us.